SIGNED ON THE BULB: With an 'E' inside a triangle and the numbers '220 32' on another area of the bulb. 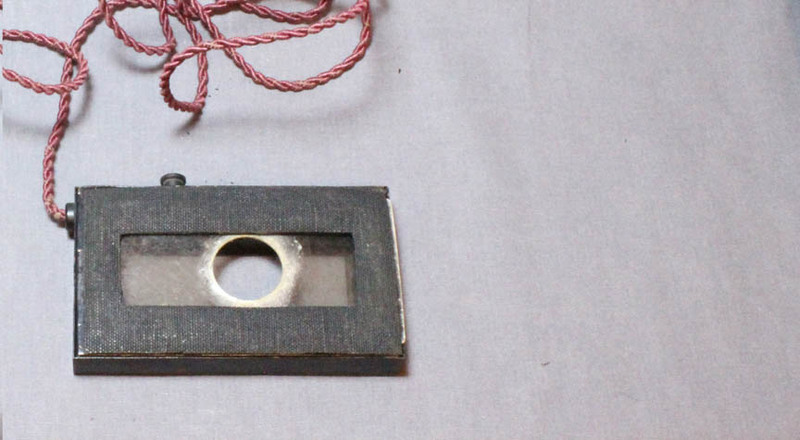 This apparatus is designed to hold a microscope slide at a specific incubating temperature suitable for various uses including the Widal Reaction to test for Typhoid Fever. It uses an incandescent light bulb as a resistor and voltage regulator. The apparatus consists of a rectangular incubating chamber, powered by electric current. 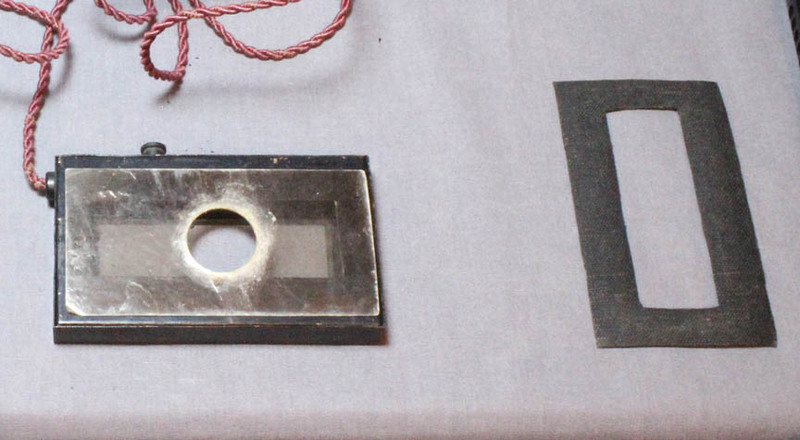 The bottom of the chamber has a ledge to support a standard 1 x 3 inch slide. The wire from this chamber has a plug which fits into the side of a cylindrical fitting which takes the lightbulb via a bayonette receptacle. The end of this fitting has the same type of end as the lightbulb so it can fit into a standard lightbulb socket of the bayonette type. A small knob on the chamber is used to adjust the temperature. 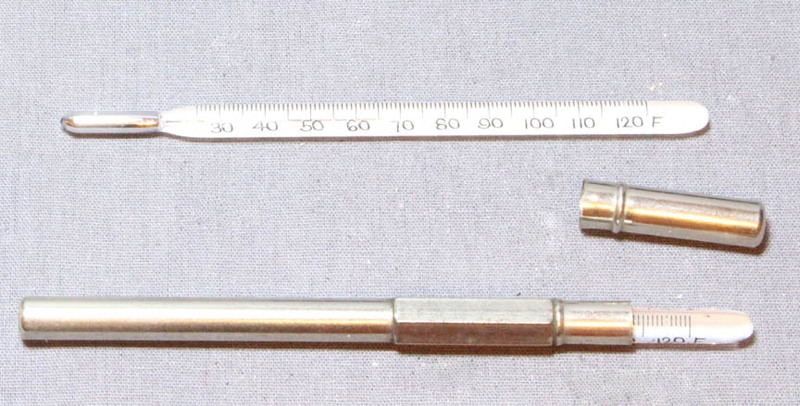 A special mercury thermometer, calibrated in single Fahrenheit degrees, from 20 to 120o labeled every ten from 30 to 120, fits through a hole in the incubator to monitor the temperature. When not in use, the thermometer is stored in a nice cylindrical nickel-plated case with a hexagonal midsection to prevent it from rolling. When in use, a semi-transparent piece of mica with a hole in the center to admit the microscope objective sits on top of the incubator chamber. A black cover fits over the mica, reducing glare and reflection. There would originally have been a rubber washer, now lacking, to fit around the objective to be lowered onto the mica plate to provide a seal for the system. The bulb has an insignia of an 'E' inside a triangle. It also has etched on it '220 32'. The latter two are likely the voltage (English Standard) and the candlepower. The 'E' likely stands for 'Ediswan,' the British company formed by the merger of Edison and Swan in 1883. The filament is thin with gentle curves. 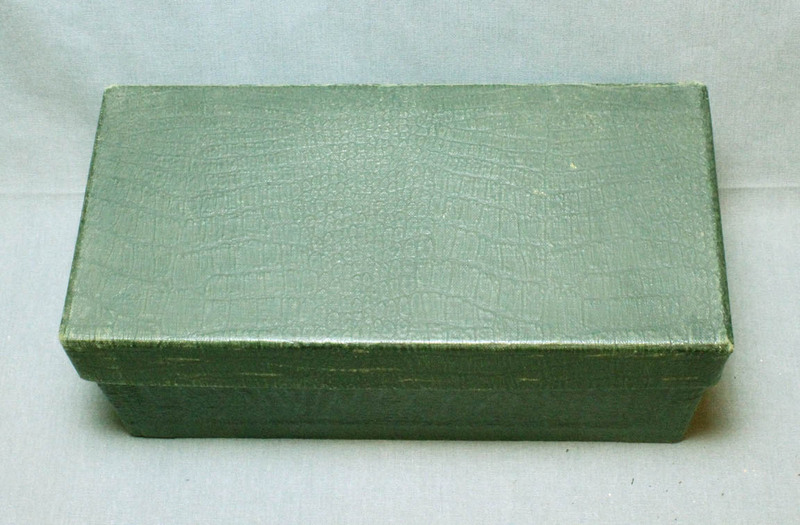 The apparatus comes in a fitted dark green faux-alligator skin-covered wooden box. The apparatus came with detailed instructions. 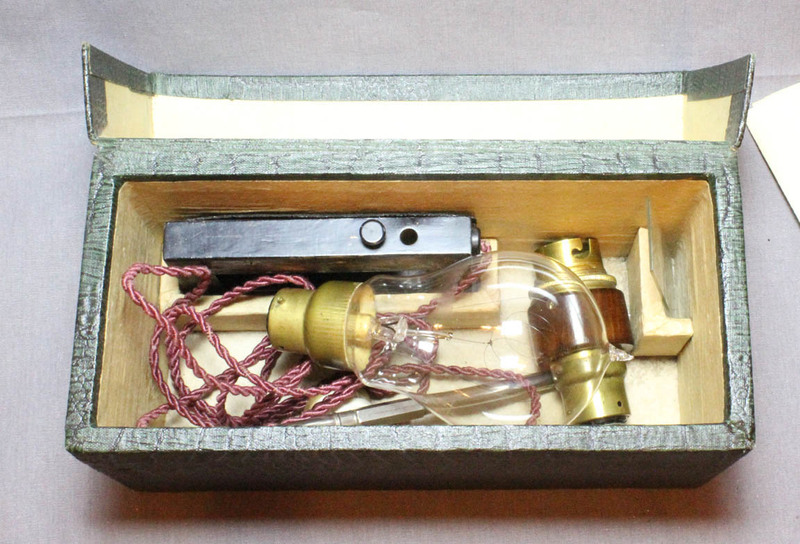 The image in the instructions is slightly different than this model in that the main electrical fitting(presumably a later model than the example in the engraving), is not Y-shaped but rather a single straight cylinder with the cord from the stage fitting plugging in from the side. 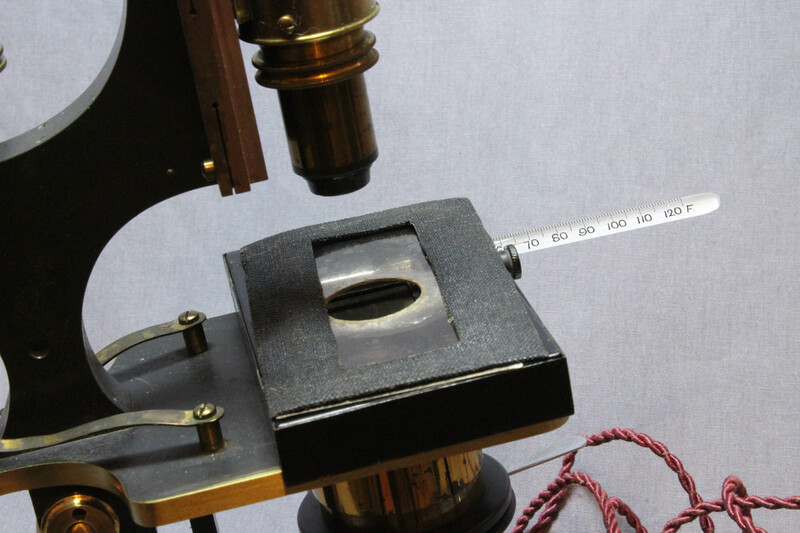 The need to examine heated or warmed slides became important as the need to study living organisms at a close to body temperature became important. In 1896 Widal of France described the agglutination test1 named after him that was used to aid in the diagnosis of Typhoid Fever. This test is performed by adding the patient's serum to a standardized sample of typhoid antigens (an actual liquid broth culture of Typhoid bacteria was originally used) and observing for agglutination (clumping) under the microscope, as well as loss of motility of the bacteria2. Since the broth is incubated at body temperature, and the bacteria are motile, it was suggested a warmed slide be used to both maintain the temperature and prevent condensation of the warmed solution on a cool slide from interfering with illumination. 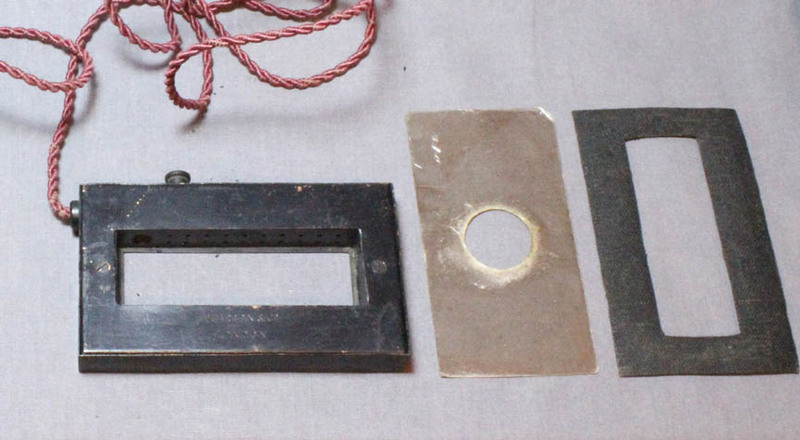 In the early part of the 19th century, this test was performed using a hanging drop preparation and a depression slide2. The degree of positivity is determined by using serial dilutions of the patient's serum to determine the highest titer at which the test remains positive. Part of the standardization of the test requires a stable temperature, something this apparatus was designed to do. Other uses of this type of stage might include observing microscopic growth at standardized temperature. Hearson's warm incubator stage was not the only model available. 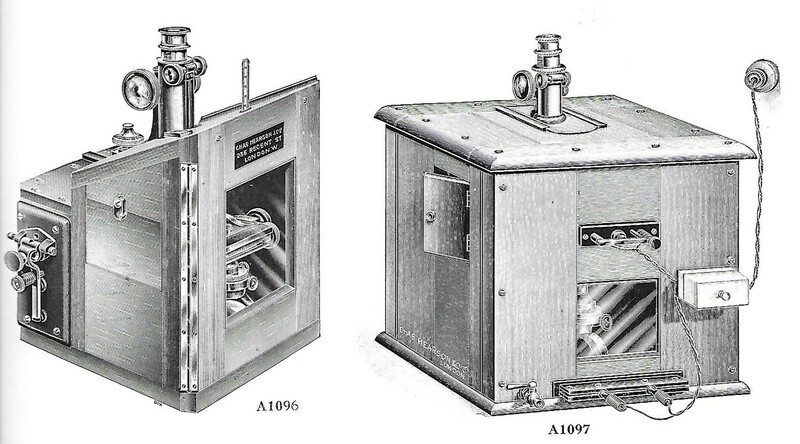 Reichert produced one(left) which depended on circulating heated water, and Leitz also made one controlled by electricity(right). The Leitz model could reach much higher temperatures, but was much more expensive. The accuracy of the temperature of Reichert's model would depend on the accurate control of the temperature of the water flowing through it, thus requiring additional monitoring, but had the advantage of a built-in condenser lens. Another method to provide a controlled temperature for a slide was to build an incubator around the entire microscope, with extensions built in to allow use of the microscope controls from outside(left). Such enclosed microscope incubator devices(left) were also made by Hearson, but of course they were quite expensive. 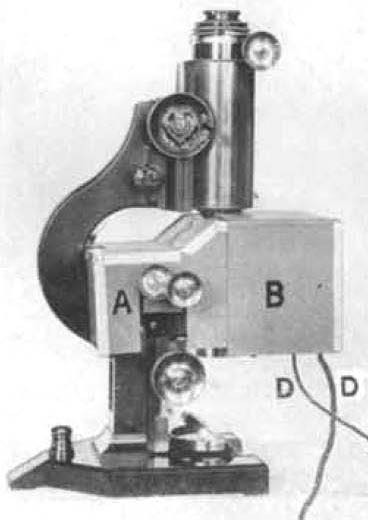 In 1928 Barnard and Welch3 published the design of a hybrid device that covered the entire stage(right), but allowed most controls to remain outside the incubator. The Charles Hearson company was founded in 19th century and continued well into the 20th Century. The company produced huge catalogs and most of their business was lab equipment, especially incubators, which they specialized in, and heavily advertised. They also sold microscopes, some of their own make, and many microscopes made by others. They also sold microscope accessories and so it is natural they would provide a microscope accessory that was also an incubator. 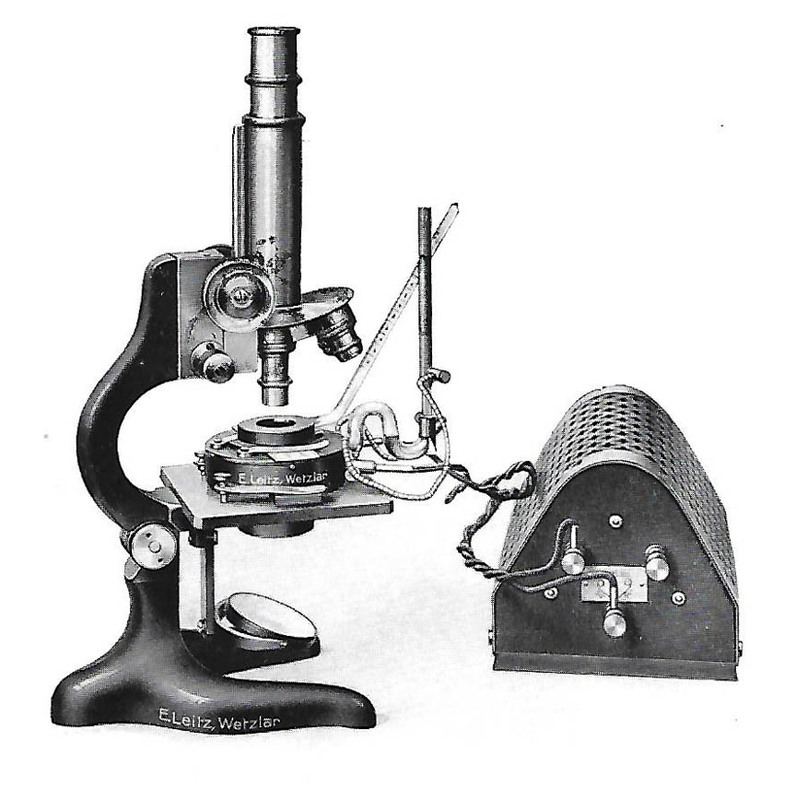 Hearson was one of the earliest firms to produce the McArthur type of Microscope. A Hearson McArthur microscope is part of this collection. The address on the instruction sheet that came with the incubator must date to after 1916, because the number '1' would not have been added to the postal code until 1917. Hearson went out of business about 1960. One of the interesting features of this incubator is the use of a lightbulb as a resistor and also an indicator but also and importantly, as a current regulator. When a lightbulb filament is used as a resistor it does not obey Ohm's law. That is, the current flowing beyond the bulb does not rise proportionately to the voltage input, because as the voltage rises the filament gets hotter, reducing the flow of electricity and preventing small variations in input from changing the output of the system. This would not be true of a simple resistor. The use of lightbulbs for this purpose was at one time a common occurrence as more sophisticated current regulators would more expensive to construct. Thomas Edison's company merged with Sir Joseph Swan's company in England to form the 'Ediswan' company in 1883. Bulbs and other electric devices sold by the company used the Ediswan name thereafter. 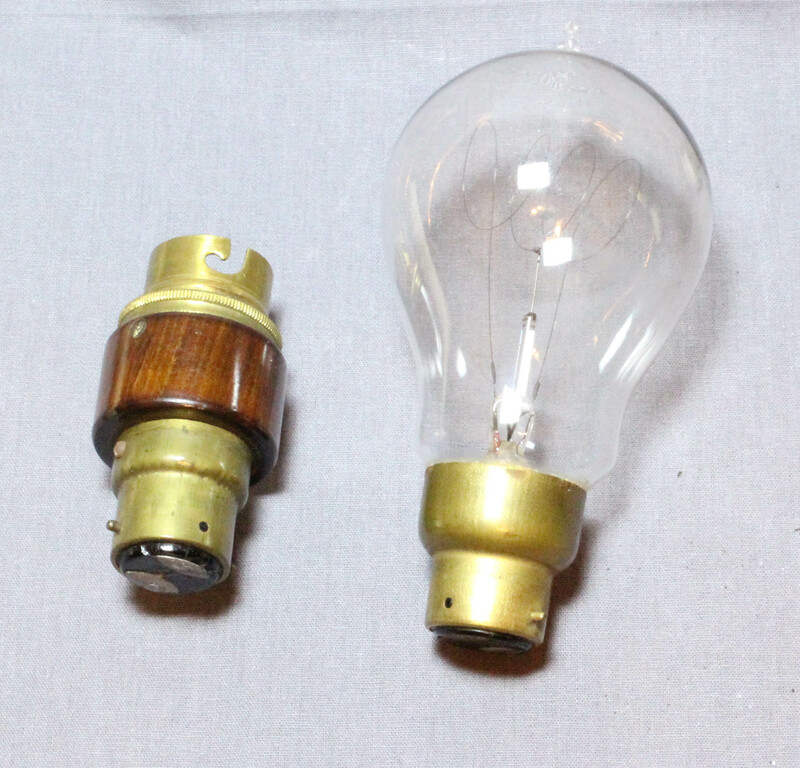 One of the differences between Edison bulbs and Swan Bulbs was the material used for the filament. 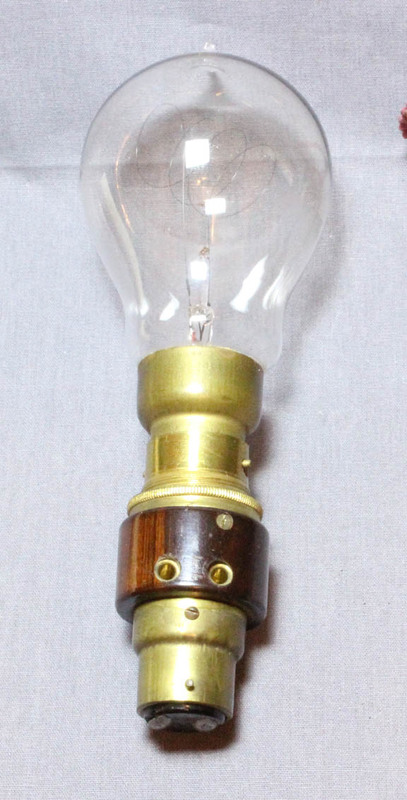 Edison used carbonized bamboo while Swan used carbonized nitrocellulose filaments4. 1. Widal, FM Serodiagnostic de la fievre typhoide a-propos d'uve modification par MMC Nicolle et al Halipie. Bull Soc Hop Paris. 1896;13 561-6. 2. Wood, FC Chemical and Microscopical Diagnosis. 2nd Ed. 1909; 229-237. 3. Barnard, JE and Welch, F.V. An Electrically-Heated Warm Stage and Compressor for Use with High-Power Objectives. J Roy Microscopical Soc. 1928 379-381. 4. Swan in England invented a practical electrical light bulb at about the same time as Edison, but Swan was actually the first person on Earth to electrically illuminate a residence. In 1883, after a brief patent dispute, Edison and Swan formed a joint company in England, using Swan's filaments, In the U.S.A., Edison's company eventually became General Electric, and Irving Langmuir of that company invented the tungsten filament. 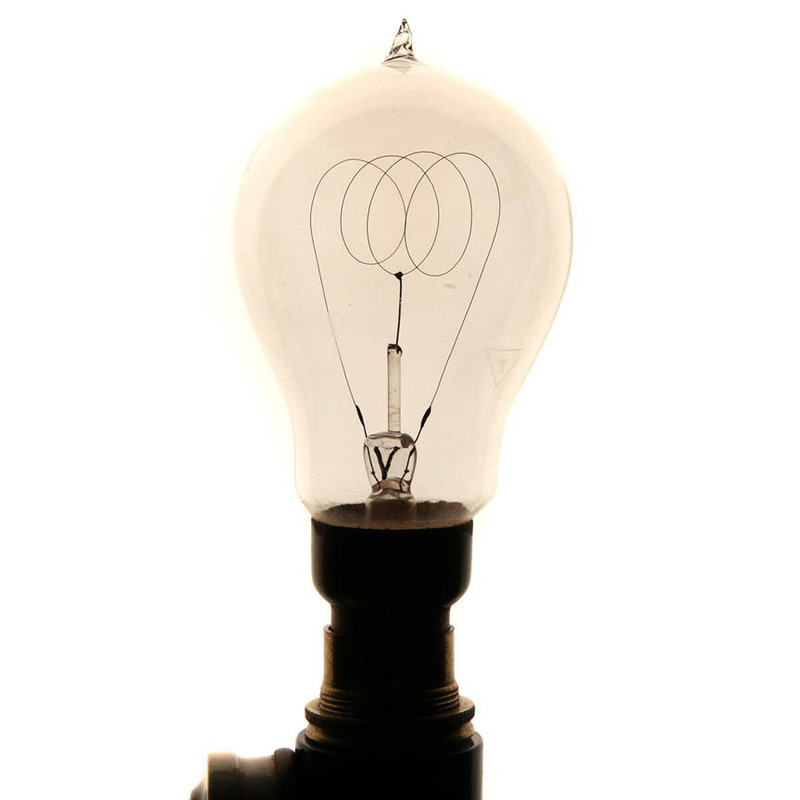 William Coolidge improved the tungsten filament into the coil form, leading to the familiar incandescent lamp that superceded the others for many years.